BMX freestyler legend Dennis Langlais joins us to talk about how he got started with BMX and how those experiences aided him in transitioning into entrepreneurship. As an extreme sports pro athlete, he was very familiar with the spotlight, but made one huge mistake. He humbly let the media slip by and did not take advantage of the spotlight and the benefits that go with it. That one mistake cost him literally MILLIONS. 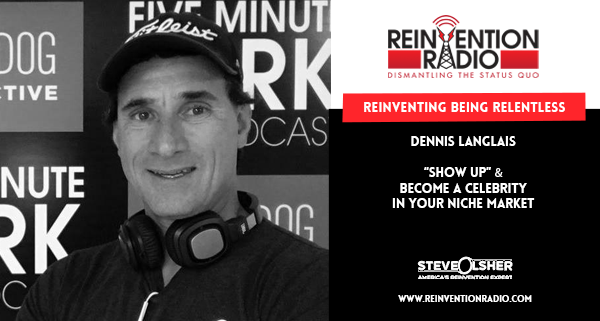 Once dubbed the “relentless warrior”, It wasn’t until he heard the words, “Show Up”, from his coach at the time that things turned around for Dennis in his business. He began to dig deeper and build upon this with strategies that unleashed his true potential. When he activates his peak performance “Show up” mode now, it’s really like uncovering his eyes and unleashing himself from a mundane life experience. The results continue to be more than he could ever imagine. Dennis is now the host of the FIVE Minute Bark podcast, with over 2,000 engagements under his belt and having earned over $2 Million. He is also known for his signature courses, “Becoming a Celebrity in Your Niche Market” and “Relentless Rebel Masterclass.” The podcast provides an inspirational theme that shares insight from their guests and has listeners in 38 countries. TUNE IN to this episode as Dennis chats with Steve, Mary, and Richard about “Showing Up” and becoming a celebrity in your niche market. From BMX star to podcaster.... here this stories of @dennislanglais many reinventions. Reinventing Commitment – In this episode, Suzanne Evans chats with Steve, Mary, and Richard about how she went from being a secretary to running her own $6 Million business.